Legendary superstar Plácido Domingo and Met Music Director Emeritus James Levine continue their historic partnership in this performance of the opera that first made composer Giuseppe Verdi famous. 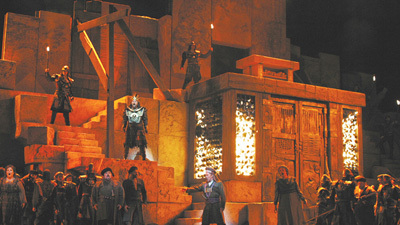 Domingo portrays Nabucco, the King of Babylon, who is supernaturally driven mad when he proclaims himself God, then restored to health when he repents. Liudmyla Monastyrska is the cruel and treacherous Abigaille, supposedly Nabucco’s oldest daughter but actually a slave, who seizes the crown and plots the death of her sister Fenena (Jamie Barton), who loves Ismaele (Russell Thomas), as does Abigaille. With Dmitry Belosselskiy as the High Priest of Jerusalem, Zaccaria.